Mud puddles, so maddening on sidewalks, are delightful when encountered in a chocolatey brownie cake such as this. Get out the pudding and let's get going! Preheat oven to 350°F. Microwave chocolate and butter in large microwavable bowl on HIGH 2 min. or until butter is melted. Stir until chocolate is completely melted. Stir in sugar. Blend in eggs and vanilla. Add flour; mix well. Spread into greased 12-inch pizza pan. Bake 25 to 30 min. or until toothpick inserted in center comes out with fudgy crumbs. DO NOT OVERBAKE. Cool in pan on wire rack. 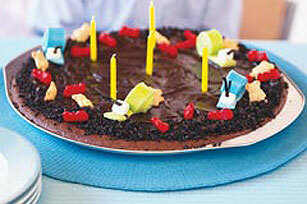 For a fun party activity, cut brownie into 16 slices; place on individual plates. Have bowls of bear-shaped graham snacks, Easy Marshmallow Snails and TROLLI Stingin' Red Ants on the table for everyone to use to decorate their piece. Enjoy this fun treat on a special occasion, but follow the serving size.